The Tunisian government provided the 17th and 18th century consuls of the Christian powers with houses, for which they paid an annual rent. 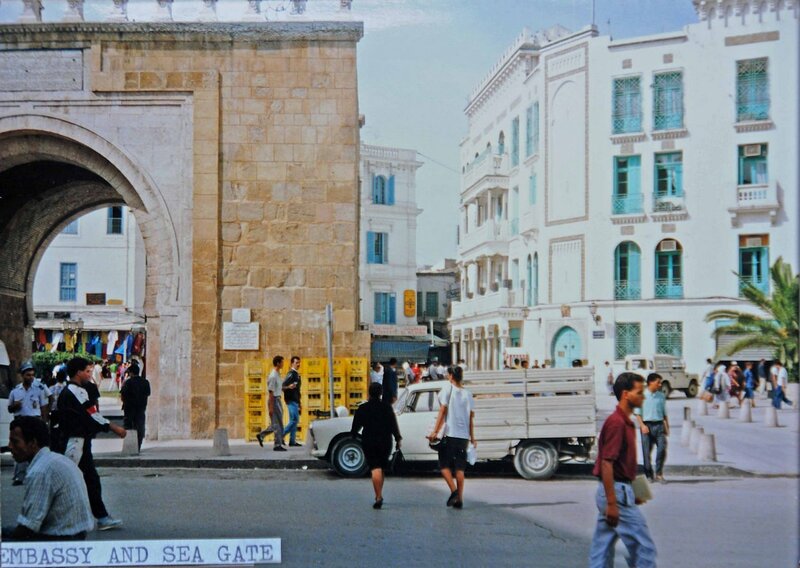 The first British consulate thus provided at Tunis, around 1650, was right in the centre of the free quarter, next to the French consulate and close to the Porte de France entrance to the walled city. The square which it fronted was later successively called Place de la Bourse, Place Cardinal Lavigerie and Place de la Victoire. The bey kept the building in repair in return for a rent of £100 per annum. 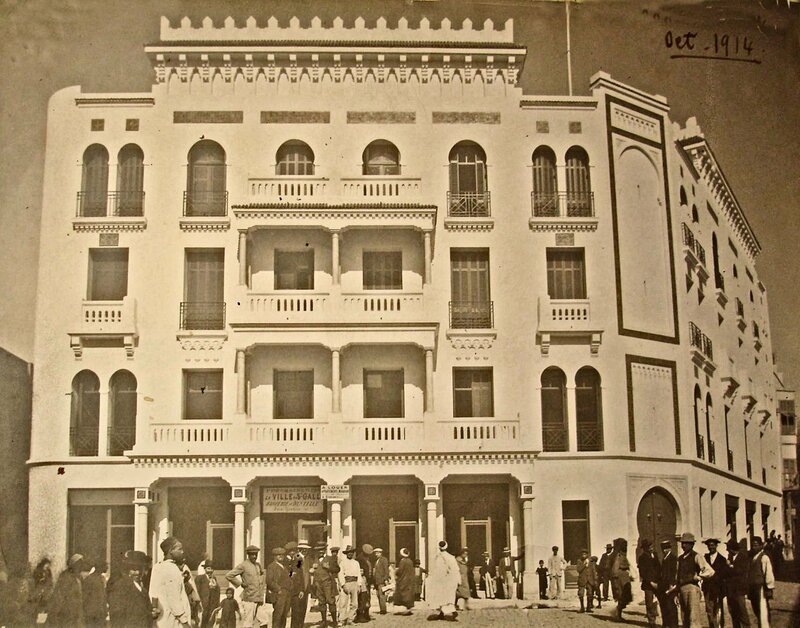 By 1825, when consul-general Col. Sir Thomas Read arrived in Tunis, the consulate building was in an advanced state of dilapidation. By 1832, he had managed to have the building demolished and completely rebuilt. In about 1875, the consul of the day took responsibility for repairs in lieu of paying rent, and by 1885 some of the lower rooms had also been converted into shops, whose rental income was devoted to the repair of the building. By 1907, the necessity of rebuilding the 1830 consulate had become evident. 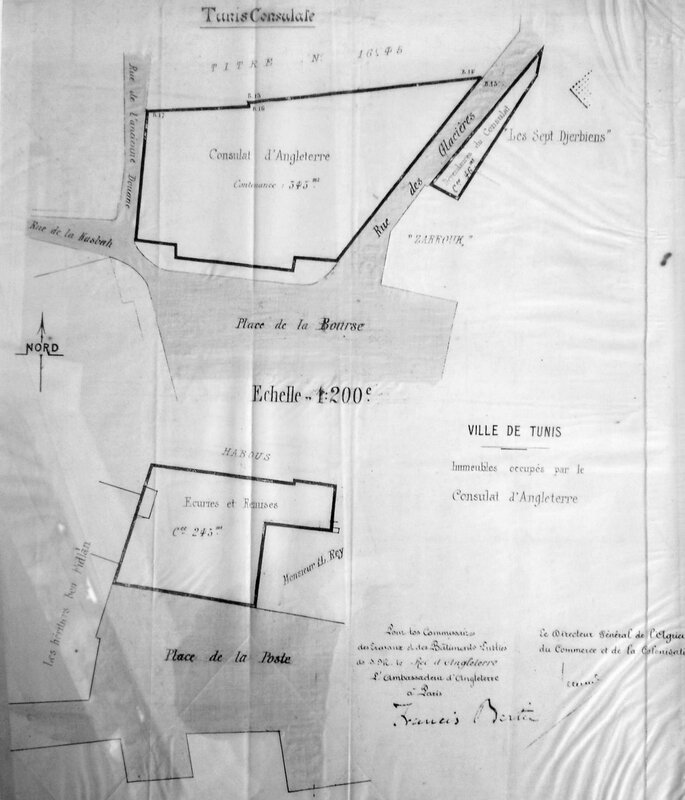 The French government agreed to cede the property, on condition that it was to be used only for consular purposes, and the Treasury agreed in 1911 to a rebuilding scheme comprising consular offices, residence and staff quarters, and even replacing some of the shops. The formal transfer of the site to the Office of Works was in 1914, and the new buildings were completed the same year, at a cost of about £9,000. There were three of them: a four-storey consulate on Place de la Bourse, single storey stables and stores on Place de la Poste, and four shops at 53 Rue des Glacières. In the late 1990s, the Société de Construction et de Bâtiment (SOCOBAT) won an FCO turnkey construction competition for a new office building on a 6,000 square metre plot in the modern area of Berges du Lac. SOCOBAT selected Tunisian architect Lotfi Rebai for the design. The building was completed at the end of 2003 at a total project cost of about £5.5 million. 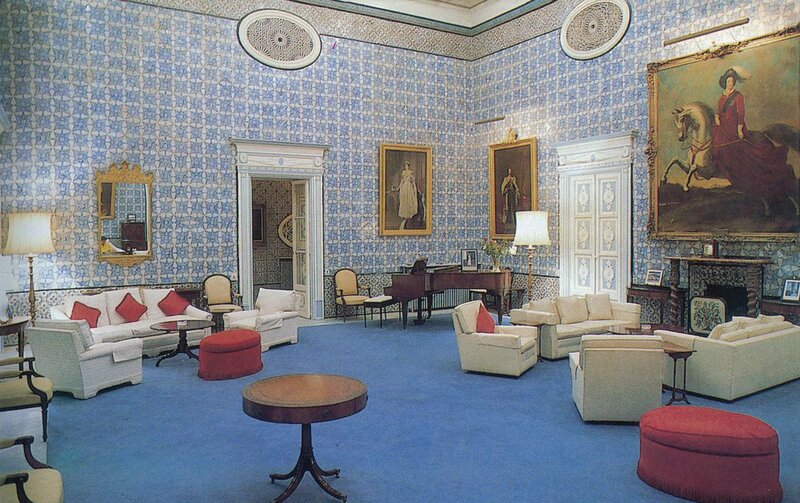 The embassy moved in, and the Porte de France property was returned to the Tunisian authorities, after about 350 years of British consular occupation: it has now been extensively refurbished. The 1914 main consulate building, at right, and the Porte de France, c.1980. Siteplan, showing three consulate buildings, c.1910. 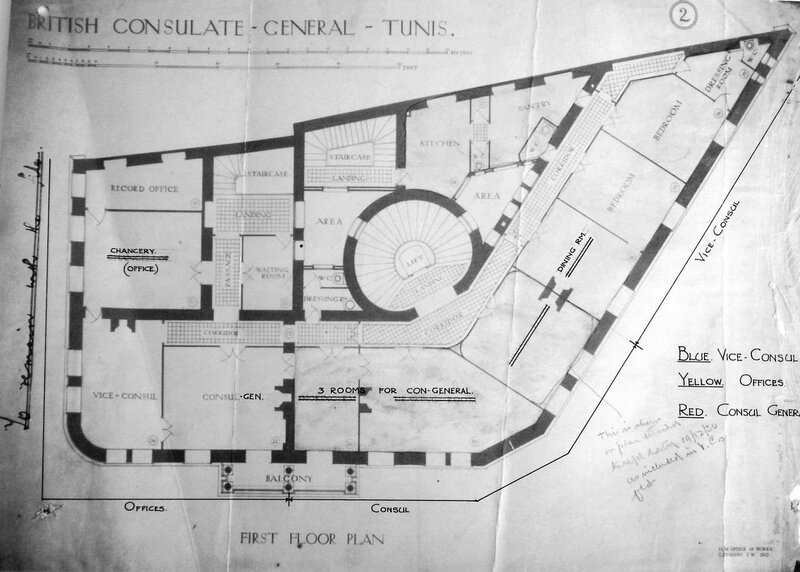 First floor plan of consulate, 1915 (with later room uses). Consulate, in the year of its new building opening, 1914. The Tunisian government in 1821 granted a house at Goletta as a vice-consular residence. In 1824, it assigned to the consul a summer residence at La Marsa, the lush coastal area where Carthage’s port had once been, about fifteen miles north-west of Tunis. This house was known as the Abdalliyah palace, and served until the agent and consul-general, Sir Edward Baynes, died in 1855 whereupon a new bey claimed the palace back because he had been born in it. The next consul-general, Richard Wood, therefore had no access to a summer residence and was forced into a succession of lodgings while he pleaded and remonstrated. A year or so later, the bey ordered that he be granted the house, known as the Bourg or Bordji, which had belonged to his treasurer, a member of the Ben Ayyad family, who had recently fled the country with much of his nefariously acquired wealth. The house at this time comprised an almost square Arab house on two floors that had been built about 1800 next to, on its west side, the vaulted undercroft and some of the superstructure of a larger and grander extension that was under construction when the treasurer fled. The bey paid for this representational wing to be completed in accordance with plans devised by Wood and executed by local labour over the next four years. Wood also enclosed the small courtyard in the centre of the old house in the course of adapting it to his use. The grounds of the Bordji comprised 5.67 hectares. The house and garden were on a narrow strip running the whole depth of the east side of the rectangular domain: the balance of the area was closely and productively planted with about 250 olive trees. The southern end of the grounds was bisected by the not very busy Tunis-La Marsa electric railway, for which land was ceded in 1872, including for the convenient Consulat Anglais station. 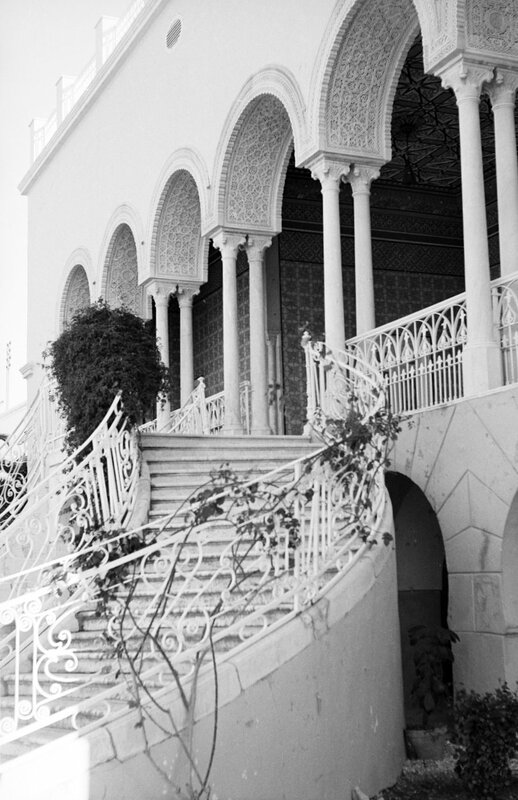 The French authorities in Tunis in 1922 proposed to regularise the tenure of the summer residence by an acte de cession. London was wary at first but agreement was reached in 1929, giving the British the assurance of continued free occupation, provided that they retained the house’s style and character, and requiring reversion (as with the Porte de France property) to the Tunisians if the head of Post should be withdrawn. 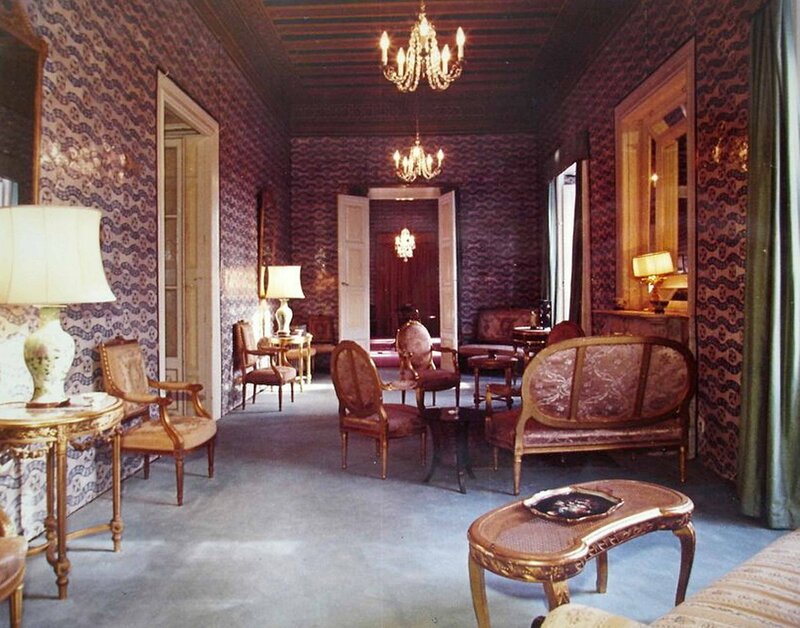 Ever since Wood took up occupation of the Bordji in about 1860, the house has been prized by successive incumbents. With the private quarters in the old Arab half, the reception rooms in the fine newer half, and surrounded by garden and olive grove, it certainly has a lot to offer. By the late 1950s, burgeoning residential developments in La Marsa were only two strips away from the east side of Bordji, and threatening to come closer. 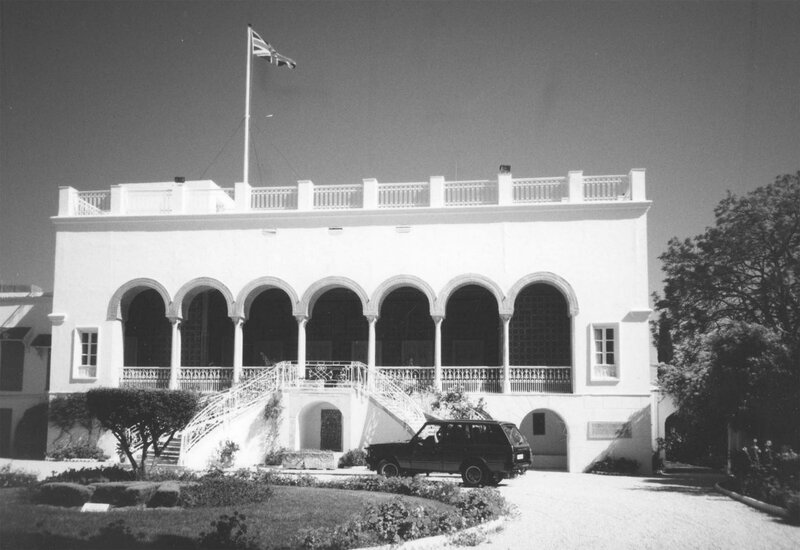 The ambassador, Angus Malcolm, thought that the adjacent strip of 4.27 hectares should be bought to protect the security of the residence. It belonged to a private religious foundation of the type locally called a habous. Although the governor of Tunis gave his go-ahead in 1958 for its purchase, various obstacles intervened and no purchase was achieved by 1965 when the land was publicly auctioned. The Ministry of Works refused to countenance a bid at that time. The field went for £2,750 but the purchaser would not exchange so another auction was held in 1966, with the Ministry this time authorising a bid up £3,500. 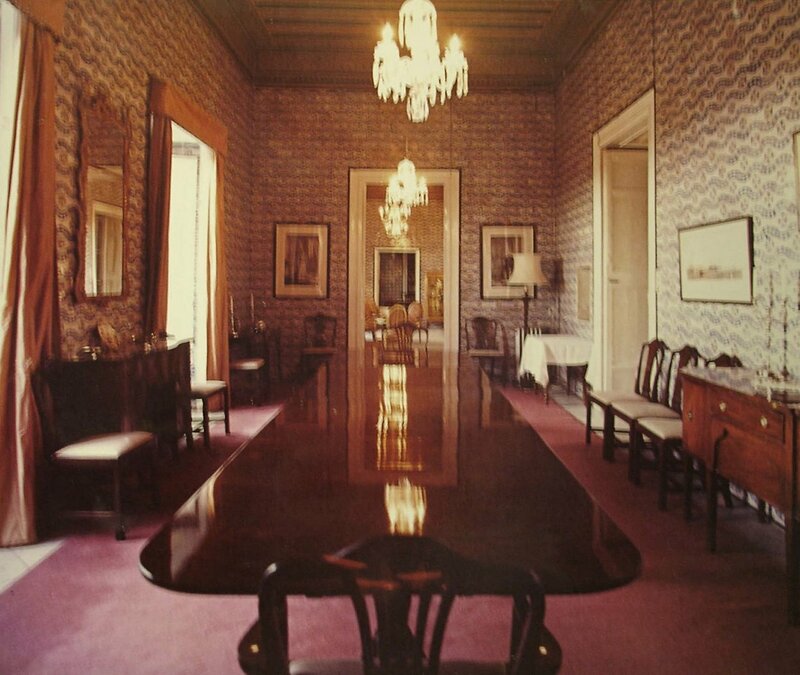 The Embassy won the bidding at £3,422 and the purchase was completed in 1968. 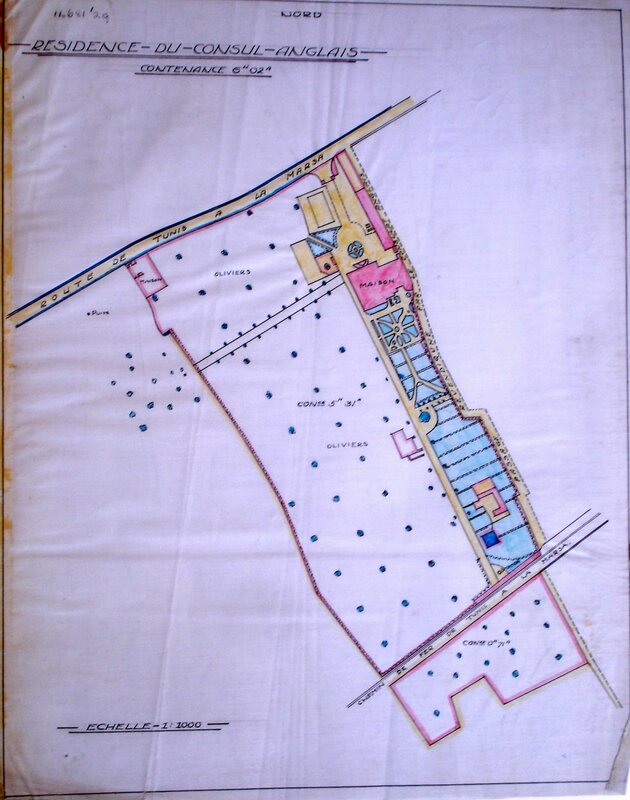 A thorough archaeological survey of the residence land was carried out in 1992 by Gary Evans, and an architectural survey of the house in 1995 by Gilmore Hankey Kirk. These were followed by a major restoration programme in the later 1990s. I have drawn on At Home in Carthage: the British in Tunisia, by Stephen and Philippa Day (he was ambassador 1987-92) published by the Trustees of St George’s Church, Tunis, 1991. Glencairn Balfour-Paul (ambassador 1975-77) also wrote an article on the house in Country Life, 3 May 1979. Siteplan, with residence and garden at right, olive grove at left (and railway at bottom), 1920s. 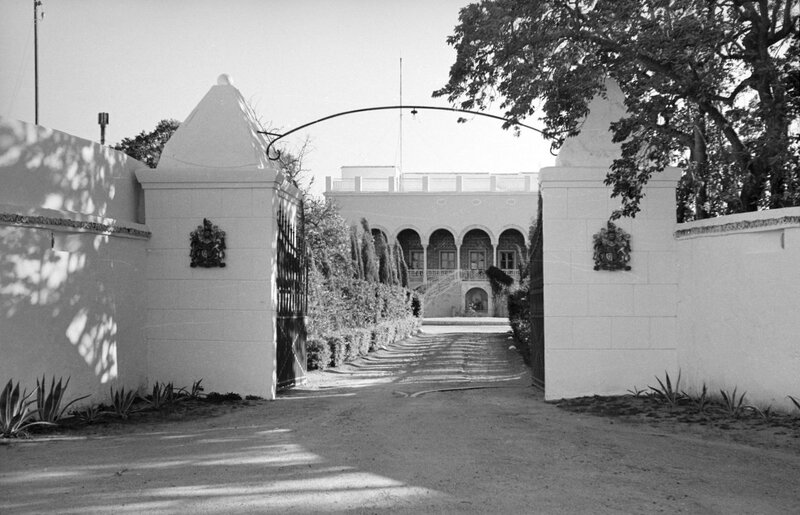 Principal entrance to arcaded terrace with great hall beyond, 1967.